As soon as we opened up our latest book pack from Parragon Book Buddies, I knew Caitlyn would love this story. She loves animals, especially dogs. At the moment she wants to be a “Dog Walker” and a “Vet” when she grows up. She rounded up a few of her cuddly doggies to listen to the story with her. She has so many dog teddys, there’s usually at least one or two by her side. We aren’t planning on getting a family dog until our home and garden are ready for one and the kids are all a bit older to help out with the responsibility too, but she loves her Nanny’s dog, Toby and loves seeing our friend’s dogs. Muddypaws’ New Friends is written by Steve Smallman and illustrated by Simon Mendez. The illustrations are so life like, they look like photographs taken with a soft focus. They are so lovely. Caitlyn is always drawing dogs and has started using this book as inspiration to improve her doggy drawings. Children can relate so well to this experience of starting school. Muddypaws meets new doggy friends, Droopy, who is a bit shy and Patch, who isn’t! 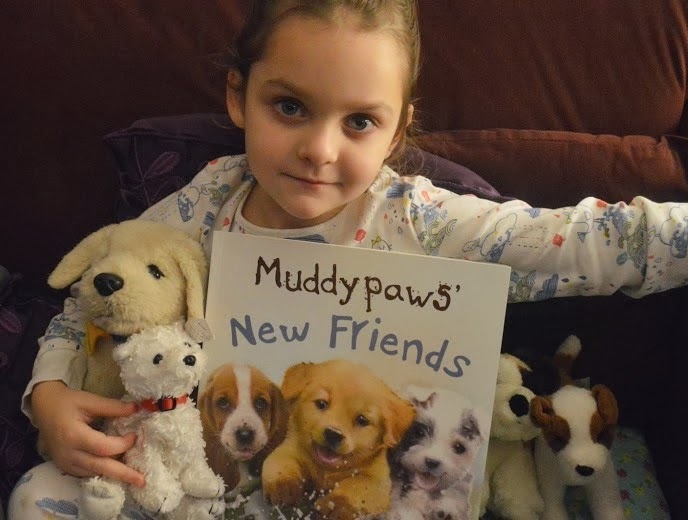 Muddypaws loves having new friends to play with, but then it’s time to start the learning. At Puppy School they are to learn dog training, such as “Sit” and “Fetch”. However, it takes a while for Muddypaws and Patch to get the hang of it. Eventually, they all learn to “Sit” in a comical way that makes us readers giggle. Muddypaws feels sad to go home, but is reassured that he will see his friends again next week. Children will love this book about charming dogs and the experience of making friends and starting school that they can relate to. It is also a good book for any children with dogs as pets to encourage them to help with the dog training. As you can see, I had help from Izzy taking the photos of the book and the doggies for you! I would highly recommend Muddypaws’ New Friends as a lovely sweet story with charming illustrations and a message about meeting new friends and keeping old ones. Disclosure: We were sent this book to review as we are Parragon Book Buddies. All opinions are our own.